A corporate campaign is an organized assault on the reputation of a company that has offended some interest group. Although corporate campaigns often involve political, economic, and legal tactics, they are centered around the media, where protagonists attempt to redefine the image--and undermine the reputation--of the target company. It is a strategy most frequently employed by unions but is also employed by special interests, such as environmental or human rights groups. Sometimes it is even employed by one corporation against another. It is a rapidly growing phenomenon that is still unknown to the general public, to most academics and journalists, and is rarely understood by the corporations that find themselves on the firing line. 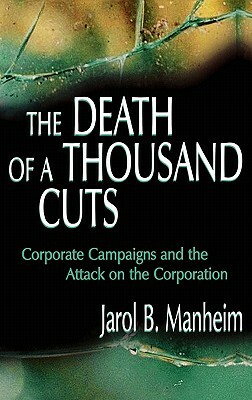 The Death of a Thousand Cuts argues and demonstrates that corporate campaigns are a distinctive phenomenon whose manifestations are today ubiquitous in both the marketplace and the media. This volume examines, in considerable detail, the history, strategy, tactics, effects, consequences, and likely future directions of the corporate campaign and of its nonlabor-based cousin, the anticorporate campaign. The book is based on ample sources and methods, among them an extensive review and analysis of media coverage, news releases, previous scholarship, union publications, campaign materials, interviews and conversations with individuals who have experienced corporate campaigns, public presentations by labor leaders and others, correspondence, Internet postings, case law summaries, documents, videotapes, and other materials. Through original data and interpretation, this book adds context and integration to these materials thus giving them new meaning. * A thorough and clear explanation of what a corporate campaign is and how it differs from other more mundane "public relations" campaigns. * A detailed examination of strategies and tactics that includes their historical development. Some of the more high profile target companies in recent years include Coca-Cola, Microsoft, Caterpillar, Campbell's Soup, Federal Express, General Dynamics, Home Depot, International Paper, K-Mart, Nike, Texaco, Walmart, Starbucks, and UPS. * Hundreds of examples that help explain such contemporary events as the anti-sweatshop movement on college campuses, the living wage movement, and the protests against the World Trade Organization, International Monetary Fund, and World Bank. * A lengthy appendix contains abbreviated descriptions of nearly 200 corporate campaigns waged by labor unions and various advocacy groups since the idea of the corporate campaign was first developed in the 1960's.